mommygorjess: Fun and Easy Family Cooking with Loisa! I cant be the only mom who feels like the weeks go by so so fast once school is back in session. I feel like its a constant circus and I am juggling a million things at once through out the day. Once the boys are home from school, and I have returned from work there is so much to be done in so little time. From homework, to bath time, to dinner. Everything needs to get done on a crunch time because even the slightest change can fully change up the routine of things. I struggled with this for a while in the beginning, and then I got better at it, and now we are back to struggling since I have started a new job with new hours, and new expectations of me. BUT, change is good. Its good for us all that we are doing things differently. I am slowly but surely getting into the hang of things, and it will soon be our new normal right? Since things have to be done at a fast pace during the week I try my best to make these routines between us feel more personal, and use it to get more in touch with my boys at the same time. Its great because we are getting things done, but I am also getting to spend the time with them that I dont want to miss out on. 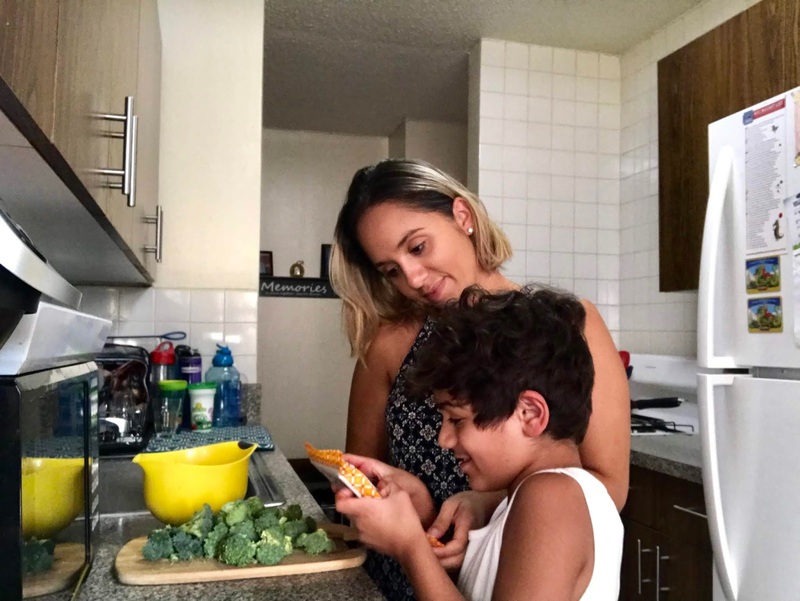 Cooking together is something I am big on, not just because it is going to get them involved in learning the process of cooking, and when they are older they will be more ready to get going on it. But also because it is a time I can connect with them, and have fun. As a child I remember that being something I truly enjoyed doing with my mother. She would cut up the meat and I was in charge of mixing the seasonings, and getting my hands a little dirty. I loved it! Plus I was proud to be helping out, and being able to say I was in charge of the end results for dinner. My boys are exactly the same in that sense. As soon as I ask if they want to help out with cooking, they are so excited to hop on those step stools and get messy. With my little one I tell him to do something as simple as dropping all the veggies in a bowl and mixing them together. My oldest always wants to go above and beyond and do all the adult things, so I am trying to get used to having him do things that are "harder" but in a safe matter. Its great though because during it we are talking about our day, and the exciting new things they are learning, or new books they are reading. As a child my mom has instilled in me our Latin roots, and the culture around it. I think everyone can agree that one of the most amazing things about the hispanic culture is the rich flavor of our food. There is absolutely nothing like it, and that authentic taste you can instantly tell by just one bite. Thanks to my mom I have strong tastebuds, and I am not too fond of bland food, yet I know its the healthier way to go since all these seasonings generally have so much sodium, and so much artificial and non nutritional ingredients in them. I really cant just un do my taste in food though, and I want to make food that can still be savory, but make better choices for my family. Which is why I was so happy to come across Loisa. Loisa is a Latin food company commited to the culture its food represents, with flavor, quality, and conveinece. 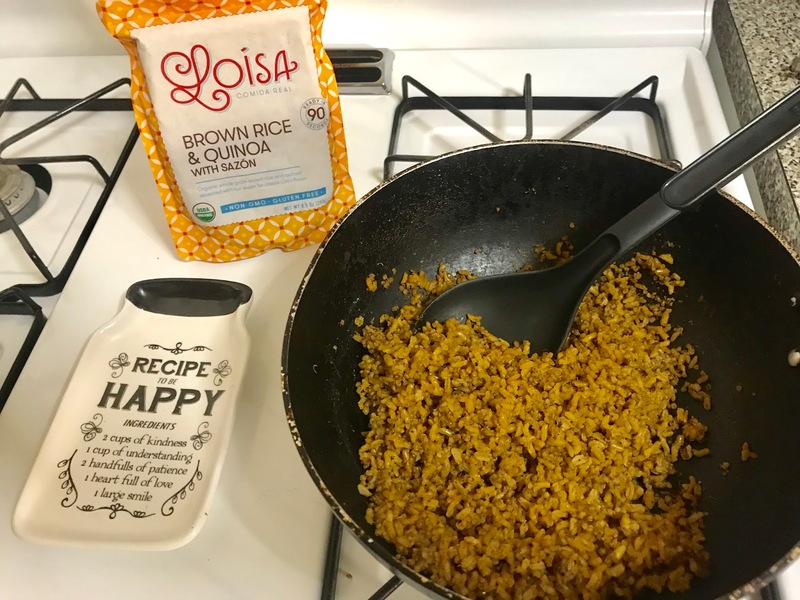 We were able to try out the Loisa Brown Rice & Quinoa with Sazon, from pouch to plate in just minutes! 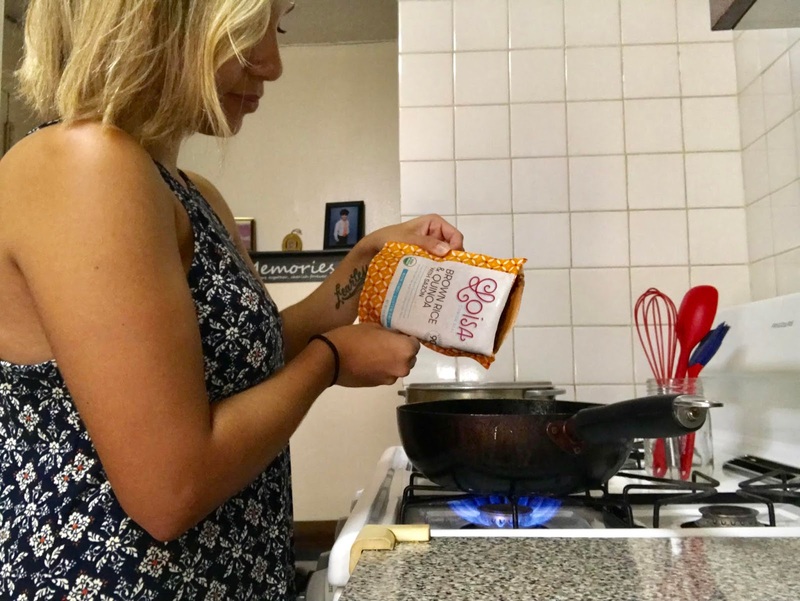 Let me just state all the amazingness real quick : Organic, Non GMO, No preservatives, nothing artificial, BPA free packaging, vegan, gluten free, and seasoned with Loisa Organic Sazon for REAL flavor that taste absolutely delicious. If that doesnt sell you, then I have no idea whats wrong with you. Its seriously insane to me that something this good for you, is actually that good. Its not something that sounds too good to be true, and then ends up dissapointing you. This is coming from a mother with two boys who are insanely picky eaters, and are so stuck in their ways that they wont usually try new things. 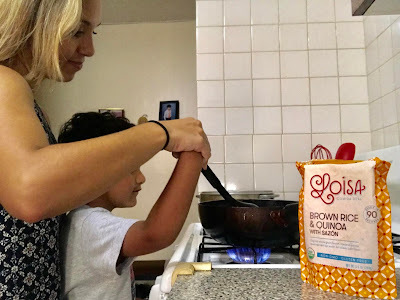 But as we were making this Ready to heat & Eat rice pouch they noticed the yummy smell it was giving our home, and they automatically knew that it might just be something they would like. I cant tell you how relieving that felt to hear them feel excited about trying something new, and they repeatidly kept saying that it smelled soooo good. I loved how easy it was to make. My seven year old had no trouble at all opening up the pouch and sitting it up straight to sit it into the microwave. Plus, its super cool when your mom allows you to actually press the microwave buttons yourself. He was so funny, and told me that he felt like a real adult by just doing that. I love how kids find happiness in the simplest of things. Once that was done my little one got his step stool out and said he wanted to mix the rice up on the heating skillet which I added 2 tbsp. of water onto. Of course I held his hand during it to be safe, and make sure he didnt get to close to the hot pan. Being extra careful when cooking with kids is a huge deal. They sometimes forget that some things will be hot and if they cant tell at the moment, it crosses their mind. So always make sure you are doing these things together, and putting your full attention into it. He is a very fearless child though, and I reminded him a couple times that it was hot, and he was just so excited to mix around the rice to fully cook it. Once it was all done and ready I let them scoop it onto everyones plate, and they just couldnt wait to try it out. They officially have a new favorite rice, and I am so happy that its one I can feed them on the regular and not worry that its going to harm them in any way, yet the quite opposite. Im sure I can easily live off of this rice myself, yes its THAT good guys! Plus, you know the struggle of making rice, from too much water, or how long it can take to finally be cooked all the way. 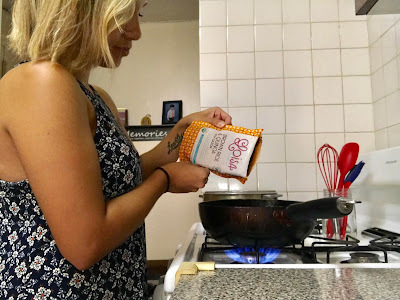 Loisa ready to heat & eat rice pouches can be made in just 90 seconds. HUGE convienence when you have twenty million other things to do through out that time. One pouch made, fed my family of four just perfectly. It was an exact amount needed for a dinner. If you are interested in making something healthy and yummy with your family you should go and check out Loisa, and get 10% off any order using the code MOMMYGORJESS. They have many amazing products that can fit all your needs and appetite. Plus, turning cooking into something fun you can all do together is a lifetime memory you can add to your kids childhood. Trust me, it will be something they will always remember! - We were sent this product for reviewing purposes, but all opinions are of my own and 100% honest.